The brake pedal looks great on my bike, the grip is alot better than my stock brake pedal. I bent my stock pedal and decided to go with a little color. 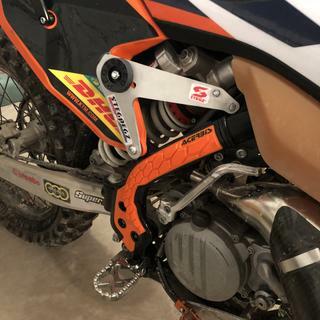 -m-2019 KTM 300 XC-- My only gripe is the brake snake cable, i had to get creative on the installation location of the bracket sent with it, its intended to mount to the motor but where i do not know, so i drilled a hole in my skidplate and it looks cool and works good, plus, if i hit anything it wont rip a bolt out of my motor. Much better product than the stock lever with the ability to replace the front piece as well adjust the desired grip at the toe. There’s no slip when putting pressure. The installation was very easy and I would recommend this to anybody that needs to replace their old break. I just got this not to long ago an it’s been nothing but awesome. It’s strong an seems like it will hold for a very long time. Fits perfect, looks and works great. I love the better feel over the stock brake lever. Great for price and probably better than others. These work really well and the leash helps a lot. The low cost on these helps too because these levers bend and break a lot in woods and are too expensive to keep replacing! Great product from Tusk as always, much better feel. The tip is smaller than stock so I had to take it off as I was always missing the brake. Awesome product, no problems with it at all! Nice looks, didn't install brake snake and bent on first ride. I'm going to try to straighten it out and install the cable. Installed on a 2004 CRF230F although is is only listed to fit 06 and up. Fit well and offers much more grip than the stock pedal. Also saved 8oz! Did not include a washer or cotter pin for installation which I believe it should. Stock washer did not fit. Also the saver cable that comes on it is garbage. The cable crimps were so loose I just pulled the cable out and threw it in the recycling. Good product by tusk! Cheap compared to the other brands of The same product but high quality! Fits great looks great! First I had to replace the OEM because it broke and push through my clutch cover on my 2017 KTM 300xc. I purchased the tusk hesitantly thinking it was going to look and feel cheap, and I was completely wrong! Very reasonably priced performed wonderfully and looks amazing! I raced this brake pedal multiple time for National Hare & Hounds and never had an issue I love the feel and I get tons of compliments on the looks. What a great brake pedal! Never had a problem with it. I recommend it to anyone that wants durability and bling to your ride. I bought one of these used. Bent it and kicked it back three separate times. The bearings were exposed due to the bending, the seals stopped sealing, and the bearings rusted and it all still worked so well I never even noticed. After kicking it back the third time, I bought a replacement for peace of mind and that's when I discovered the damage to the old one. I would've never known. Great product! I have used Tusk brake pads, replacement levers and air filters over the years and they were all great. This brake lever was an exception and I would not recommend it. Two biggest complaints are the tip is too small and although making it pivot seems like a way to keep it from breaking off it was constantly turning in on me when using the back brake. Put it in my spares box in case I need one in a pinch but went back to stock lever. Love the Huge Spiked tip. Great Looks, Perfect fit, Great price, shipped on-time matches the shifter lever for that "factory ride" look. Kept the OEM as a spare cuz I crash a LOT! Worth the money you spend and adds a little bling if you are into that kind of stuff. Make sure you follow directions. Work and grips well. Worth the money. Bought this as a replacement and i can say i am very impressed. the studs on the pedal give you confidence that your foot wont slip off in the muddiest of conditions. Race proven this weekend !! Tusk rocks ! Great look and fits perfectly but the break snake is too short for my bike and had to get a longer cable. I was blown away at the quality of this pedal upon arrival. Super easy to install too. This pedal gives a sure footed feel on my brakes. Fitment was perfect. Looks great and seems durable so far. For the price, this lever is beefy, has good toe grip, easy to install. Highly recommend, even can get replacement tips if you bend or break. Perfect replacement for my bent brake lever. Quick install and looks great. 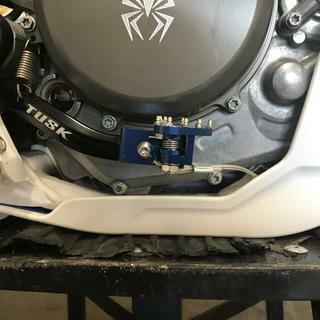 Man i gotta say I am so disappointed in the Tusk Brake Pedal .. I just finished a complete resto of my 02 YZ250 and purchased this to finish off the build. Sad to say it bent in less than 2 hours on my first ride .. I clipped a rock coming around a corner in some tight single track and the pedal folded like butter .. And not a little tweak, i'm talking a full 80 degrees up. For reference i have been riding for over 20 years and have NEVER bent a OEM brake peddle on any of my bikes! This is my 3rd Tuck brake lever. This is a great overall part, but you should not expect anymore than 50-70 hours of use before the brake tip becomes super loose (Can't really be tightened without hacking it) and the spring no longer will allow the tip to remain stable. Sweet looks and tuff! Dropped bike onto lever side and did not damage it! I like the fact that the head pivots and is replaceable. Great product from tusk. This is a nice part. Very good quality and looks nice. Looking forward to install and use. A great quality product at an affordable price point. Buy this aftermarket and you'll love this product. The pedal has a nice feel with the brake time being ridgid enough to feel and not slip. YZ 250 2 stroke. Used on an 11, 15, and 17. Love it, the gets sloppy after about 60 hours but will last 100 easy. With very little adaptation it fit perfectly on my 1997 Gas Gas EC 250! Lasted the whole 540 miles of the Vegas to Reno! So far so good. I highly Recommend This Product. Specially if you are doing a lot of riding in rocks! I love the tusk products. Great quality for the price. This break leaver does bend fairly easy compared to stock but is easily as good as other name brands that cost more. But I like it and I use it. On my second one and will continue to use them. Thumbs up for tusk and Rocky Mountain. Excellent product, fitment, and price. It went on perfect and it helped me get better brake control. I can actually feel the lever with my mx boot a little. 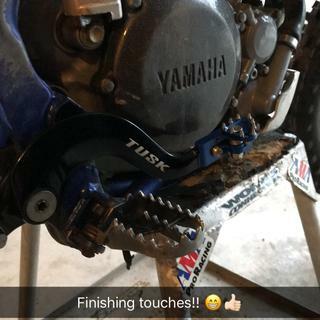 Yz250fx rear brake pedal on ball bearing yep! So worth the money! Easy installation. I've had run in with rocks and it didn't affect the part. Plus it looks flashy. It says it will fit a 2018 husqvarna fe350 and fe450. Will it fit a 1018 fe501? BEST ANSWER: Comparing schematics it looks like the 2018 FE350, FE450 and FE501 all have the same brake pedal. So this should fit your 2018 FE501 if you order for the 2018 FE350 or FE450. Can I get a yellow or gold tip for thus instead of a red one? BEST ANSWER: The only color options are listed on the web site. Want a red tip for my Yamaha? BEST ANSWER: I looked into this and unfortunately we only have the blue tip for the Yamaha's at this time. is the brake tip any larger than the stock one ? BEST ANSWER: The brake pedal tip is larger, that's the main reason I bought it. That and it has nice grippy studs on it which provides good feel. It is also a little longer. I drilled and tapped another hole for the brake tip to attach to that is closer. My stock lever was broken but the Tusk lever fit on perfectly and my son didnt mention any different feel in length. I believe it is pretty close to the stock size. No it's about the same size . Lots more grip and a great replacement to stock . All tusk products I have bought are top shelf .. It is a little bigger, however it has a superior grab when depressing it. Very happy with the quality and performance! NO!!!!! For a 2017 KTM 350sxf It is smaller and the length of the pedal is 10mm shorter. No the tip is the same physical size but it has more pins or teeth to give better grip. I have a 2012 KTM 450 SX-F. My original brake arm has no cable, can I remove this cable on the Tusk arm, or is there a requirement for this? It can be removed as its not required to fucntiin. we removed it on our 125 install and it has been working great. Cable is separate in the bag, u don't have to attach it. Tusk brake pedal is great, I'd buy it again. Yes, you can cut it off. No requirement. If the brake arm breaks you can reuse the foot pad. No u don’t have to put it on there, it’s separate. Is the tip adjustable for boot size on this tusk pedal? BEST ANSWER: Feeling around on the back side of the pedal, there is only one threaded hole for attachment of the tip, so no, it is not adjustable for length. There is one allen head screw that secures the tip in place. Additionally, the braided cable keeper passes through the tip and the petal itself, making it difficult to remove. No, it isn't , but does not need, the end of the pedal is flexible and wider than the stock. My boots size are 11 and i am sure a shorter or larger size works great! the best you can get for the price. I hope this will help you. No, without replacing the tip with a different one, there is no adjustment that can be made. Very durable and easy to contact brake pedal though. No it is not adjustable. I wear size 14 and the pedal works great. I like it better than the stock one. no the tip is not adjustable for boot size on the tusk rear brake pedal. It is not adjustable for boot size. How do you set up the snake cord? Just crimp it with pliers? Install it correctly and if it comes loose it will stay with the bike. Bolt securely. Yes, you can squeeze it with pliers if no crumpet available. I used channel locks. A big set of vice grips and strong hands worked in a pinch for me. Does it come with a replacement brake pedal bolt? Mine just came with the bolt installed, no replacement. Mine did not. I had to order it separately. Do I have to drill a hole in it for the original spring return? BEST ANSWER: No. There is a smaller hole below where the pivot bolt is. I run this pedal on all three of my bikes and it has always had a oem fit. No you do not. If you order the correct one for your yr model and make it will fit perfect. Didn’t have to do anything to it for my ‘09 ktm. Will this fit husqvarnas with magura brakes? BEST ANSWER: Brody, if you go to the Rocky Mountain ATVs web site and type in your bike information it will tell you if it will fits. As far as the product I really like it and it is holding up really well. Mine is on an rmz450 and I race cross country. I have but I've ordered multiple things in the past that I've had to return because they came made for brembo brakes not the 2019 magura brakes on the huskys. I would say yes. It seems that it’s machine specific. If it says it’ll fit your Husky, I would guess it would. 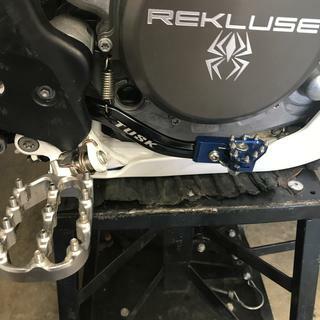 The brake tether was kind of hard to use in my KTM with the skid plate I was running though. I have it on my 2009 Fe450 Husaberg,which has Magura brakes and it works great. Not sure if that helps a little or not. I don’t know. 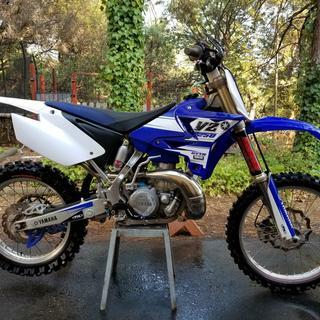 I have a 2015 YZ450F. It fit my bike great and I have had no issues with it. Will it fit 2019 Kawasaki klx 140g? Will this fit on a 2002 Cr 250? Would it fit my 97 CR250R? BEST ANSWER: This is not listed to fit this machine. I have a 2006 Honda CRF 230F I know some of the 150 Parts will fit my bike will this work on my 230? Thanks. BEST ANSWER: this will not. Does this fit an 03 Yamaha wr450f? If it fits the 250 size, I see no reason why it wouldn't fit the 450? BEST ANSWER: They are different for each machine. they have to change this most likely do to the engine case size on the 450. and we have not made one for that machine. i apologize for that machine. Will the brake lever for the 2004 honda crf250r or 250x fit my 03 honda cr125r? BEST ANSWER: it will not fit. the bend on those bikes is different then yours. thank you for your question. Will the brake lever for the 2017 Honda CRF450x work for the same year 450r? BEST ANSWER: i believe so. Will this lever clear the rekluse core exp 3.0 cover without the provded shime? 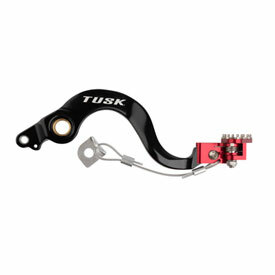 BEST ANSWER: Yes the Tusk Aluminum Brake Pedal will clear and function properly. I know a lot of honda parts are the same between all models..will a crf250r brake pedal fit my 02 cr125? BEST ANSWER: I have checked into this for and unfortunately, the brake pedal for the crf250r will not fit your 02 cr125. I'm sorry for the inconvenience. 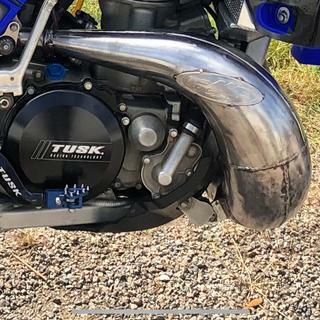 Will this fit a wr250r? 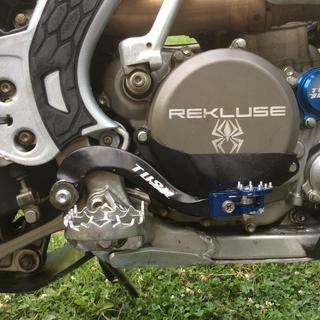 I would like this bake pedal for my 06 RM 250, will the 06 RMZ 450 part fit the 06 RM 250? BEST ANSWER: Unfortunately it will not fit on your RM250. Hi, can i choose another color for the tip? Can you send it to Argentina? BEST ANSWER: If you click on the color drop down box you will be able to see the colors available for your machine. Yes, we do ship to Argentina. You will need to email sales@rockymountainatv.com with a list of items you would like to purchase and your full address.